Tired of going to the salon? 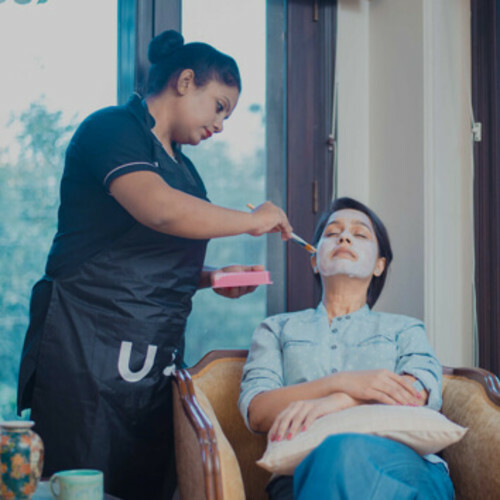 UrbanClap provides services like Waxing, Facial, Manicure, Pedicure from senior beauticians at home near you. Our 4.5+ rated experts use branded, disposable and hygiene friendly products. Get beauticians with 5 years of experience at home for the lowest price. Book beauty parlour service at home in Delhi with a few clicks, to have a hygienic and mess-free experience. I'm really happy and satisfied with her services. She was on time and very professional . Superb experience with her...patiently does her work..!! She was very nice. Service was good. Very lovely service. Rina is gentle and thorough with her work. Job is done very well and experienced lady..
Really amazing service. So satisfied that Will book for next month also. She is good n very professional. She does her work veery efficiently. She is a complete professional. Polite and professional. Friendly lady. She was punctual on time, very sweet behavior and professional in her work. She is an active individual and perform her tasks very well. Very polite and professional, will book her again. The professional was ok. Eyebrow done was good. Detan was fine. The hair spa products provided by urbanclap are not at all good. After washing and drying hair, it looks like normal shampoo conditioner application. No smoothness, no shine, nothing worked. Total waste of money on hai spa. The longer the hair, the better the wax will grab the hair and will pull it out. Ideally one can wait for 3-5 weeks before getting waxing done depending on the hair growth. In case of emergency in the face of an event you need to go to, we suggest you wait for at least 7 days before another round of body waxing. A word of advice- never clip your hair before your waxing day. The process involves ripping out the hair from the follicle and it is a painful process. However, the pain threshold for waxing varies from person to person. Those who have thick hair, sensitive skin and/or getting waxed for the first time particularly undergo more pain. That is why it is highly recommended to go to not just pros but skilled salon beauty professionals. Our professionals undergo a rigorous training process before being a part of UrbanClap, despite having years of experience in the field. This ensures that you get the desired result with minimal inconvenience. Yes. We recommend you inform the service professional about the same before you confirm the appointment. However, there no difference in charges and you will be charged as per our price points. Everyone does not have the same growth pattern or the rate at which hair regrows. Some are lucky to even not have a re-growth for months. Even your ethnicity affects your hair growth. However, on an average 4 weeks is the time it takes for your hair to come back. If you are getting waxed for the first time, start with getting it done every 2-3 weeks for at least 3-4 times. This also helps in prevention of ingrown hairs to grow. After that it completely depends on how noticeable the hair, how much it bothers you and what is your salon budget. On an average waxing is done every 4-6 weeks. Always avoid a razor as it not only results in cuts and scrapes but also makes hair harder and darker the next time it comes. Waxing becomes a painful process when hair is harder (and smaller). Since waxing pulls the hair from the follicles, the hair that comes back is always softer and weaker. Hence, easier to pull. Waxing sticks to your skin and removes the top most layer of it. Hence, it not only exfoliates the skin but also removes significant tanning. Here are some tips that can make the process easier on you: Follow the steps for reducing the pain (given above) Experiment with the kind of waxing to know what suits you the best Do not trim your hair before you get waxed Do not shave in between waxing sessions. The hair will be shorter and difficult to take out and you will also have more ingrown hair. Yes it does. Certain medicines make the skin sensitive by thinning them out. This makes it more likely for your skin to burn or peel during a session. Please let the salon professional know the medicine that you are on so they can recommend you the type of service you should go for. Yes you can. However, during pregnancy your skin is extra sensitive and needs to be treated with hard wax. Ensure that the professional knows about your pregnancy and always go for the trained salon specialists from UrbanClap. Double dipping is the term used when a professional dips the same stick used in waxing back in the wax after applying it on you or anyone else. Our professionals use fresh sticks to avoid bacterial infections and use sterile methods to apply wax so you don’t have to worry about contracting an infection. Facial skin is sensitive and needs extra care than the rest of the body. It is perfectly safe to get your face waxed but you need to get it done by a verified and a skilled salon professional, like the ones available on UrbanClap. Our salon professionals use the best equipment which is sterile before use. They also ensure minimal dirt and clean up after they have worked their magic. Your home is definitely a safer and a cleaner place than any salon near your home (or anywhere for that matter). There are some days when all you want to do is stay home and relax even though you need a facial and hair spa badly. Until a few years ago, you may have had no choice but to step out and go to a salon to get the facial and hair spa treatments or stay at home and wait for another suitable time to visit the salon. Thankfully, these days you can avail the salon at home services provided by experienced beauticians who come to your home and take care of all your hair, makeup and skincare needs. This has led to a radical growth in the salon services and it tends to be constantly expanding. Save Time: Going to a hair salon can waste a lot of precious time for you. You need to dedicate considerable time out of your day for it, visit the salon and then wait for your turn to avail the services. If you opt for beauty services at home, you can relax at home and the beautician will come to your place at the appointed time. Feel Comfortable: You can read a book, listen to your favourite music or even doze off after the treatment if you so desire when you avail salon at home services. In a salon, you have to be in an unfamiliar environment during the treatment and have to leave the salon immediately after your beauty treatment. This negates all chancesof having the same relaxed feeling through the rest of your day. Relaxed Services: When you are at a hair salon, the beautician has to think about other customers waiting for their turn. The therapist may be in a rush and try to finish off the treatment fast. 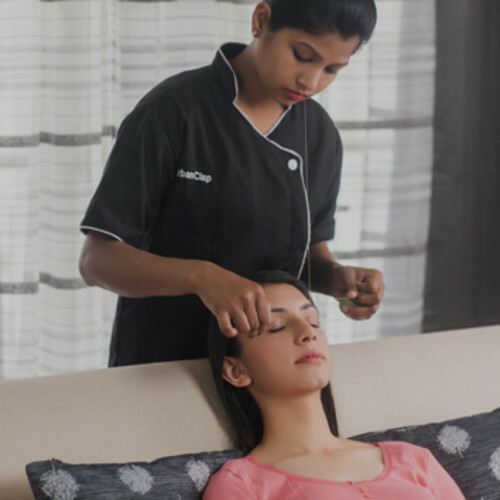 When you hire a beautician at home, they are booked for a fixed time duration and can be relaxed while giving you the beauty treatmentsince they do not have to deal with other customers. Group Treatments: You can have a great pamper session with your besties at home when you avail the salon at home services. All of you can also get ready together toparty thanks tothe help of these beautician. If you go to a salon, all of you will have to wait for your turns and be in different rooms for your treatments. It will not be as fun and relaxing as it can be at home. Be it Girls or Ladies, generally everybody loves to go in groups for Salon Services. Glow Facials: The products used for this type of facial therapyadd glow to the skin. Anti-ageing Facials: Meant for people dealing with fine lines and wrinkles, the products and techniques used in anti-ageing facialshelp smooth out the fine lines and nourish the skin. Brightening Facials: Dry and dull skin can be easily brightened with a brightening facial spa. These facial treatmentsare usually meant for people with a dehydrated skin. De-tan Facials: The products used during de-tanningfacial therapy remove tanning and help lighten the skin back to its natural shade. Cleans pores: The pollution and dirt in the atmosphere can cause a lot of skin damage. These particles can settle in the pores of the skin. When exfoliation is carried out during a facial, the pores of the skin get cleaned thoroughly revealing clear skin. Massages to improve appearance: One of the important steps carried out during a facial or facial cleanup is massage. This massage helps circulate blood, relaxes the muscles in the face and help in lymph drainage. This helps remove toxins from the body and improves the appearance of the skin. 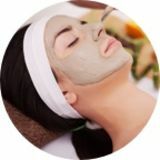 Includes face masks according to skin type: Facial masks applied during a facial are specific to the skin types of the person. If a person has a dry skin type, a moisturising mask is applied to the skin. For an oily skin, a gel or water-based mask is applied to the skin to remove excess oil from the pores of the skin. Many people do not know the frequency of facial treatments that is suitable for them. Many skin experts believe that getting a facial once a month is ideal for young people while people with mature skin will benefit from getting facials once in two weeks. Taking care of the face is important but so is the need to pay attention to your hands and feet. Dry and flaky skin on the hands and feet show that you do not take care of yourself. These areas of the body are also more prone to looking dull and lifeless. Cut, File & Polish: This is a basic manicure and pedicure process. In this, nails are trimmed and filed into the desired shape and then nail paint is applied. Classic Manicure and Pedicure: This involves grooming the nails and massaging hands and feet with nourishing creams and lotions. Nail paint is applied to the fingernails at the end. Spa Manicure and Pedicure: This involves using products that remove dead skin and tanning from the skin. A mask is also applied to the hands and feet at the end of the massage. The client’s chosen nail paint is applied to the fingernails at the end. De-tan Manicure and Pedicure: Special products containing detanning ingredients are used during a detan manicure and pedicure. If you have tanned hands and feet, just one session of a detan manicure or pedicure can help lighten the skin considerably. Soft Waxing: Here, a thin layer of soft wax is applied in the direction of hair growth and a cloth or paper strip is applied on the wax. Then, the cloth is pulled off in the opposite direction. The wax sandwiched between the skin and the strip, sticks to the strip and pulls off the hair from its roots. There are two main types of soft waxes: cold wax and hot wax. Soft wax is best for body hair that is soft and thin such as on the back, abdomen, face, legs and arms. Hard Waxing aka Peel-off Waxing: For hard body waxing, a relatively thick layer of wax is applied to the hair on the skin in the direction of the growth of the hair and then the wax is pulled off in the opposite direction. No cloth or paper strips are needed in hard waxing since the wax is peeled off. Hard body waxing is ideal for hair that is coarse and thick such as eyebrows, underarms and the bikini area. Search for ‘waxing near me’ to find us if you have any queries on this. The method of hair removal in which a cotton or polyester thread is doubled and twisted and then rolled over areas of unwanted hair is known as threading facial hair or simply threading. It gives precise control to give the desired shape to the eyebrows. Unlike tweezing in which only one strand of stray hair is removed, multiple hair strands can be removed with threading. Since it can only work on a small row of hair at a time, threading at homeis more suitable for facial hair removal. Heal from Within: The deep conditioning treatments of hair services strengthen the hair follicles and nourish the roots. Increase Hair Growth: Massage carried out as a part of the hair spa treatment revitalises the scalp promoting hair growth. Improve Blood Supply: The hair servicesmassage stimulates blood circulation and helps in the growth of healthy hair. Nourish the Hair: The products used in a hair spa treatment nourish the hair and make it shine. Longer Lasting Colours: People with coloured hair get a lot of benefits out of a hair spa treatment since the massage stimulates hair growth, nourishes the hair cuticle and moisturises the length of the hair. This makes the colour last long and appear fresh even after a few washes. Party Makeup Artist:When you are going to attend a party, you need to look your best. If you do not have great makeup and hair styling skills, you can hire a party makeup artist to do your makeup on the day of the party. The makeup artist will bring in a professional makeup kit and do your makeup keeping your outfit, preferences and skin tone in mind. You are bound to steal the limelight at the party. Mehendi Artist: Whether there is a festival or a wedding, mehendi application is customary. In addition to hiring a beautician who will provide beauty services, you also need to hire a professional mehendi artist. You can hire one from UrbanClap in your city easily. When you provide the details such as the number of people who need mehendi application, date and time to avail the services, you will also be able to get an estimate of the charges. Spa at Home:You can enjoy a spa day at home and relax completely by availing “Spa at home” services. UrbanClap has many registered members that provide these services in different cities in India at great prices. 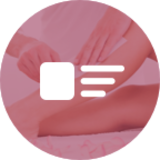 You can a full body massage, reflexology, body scrub or other spa treatments right in the comfort of your home by simply visiting our website or downloading our app and opting for these services.